In parts I and II of my Liveaboard Life blog series, I shared how living with less helps me live in alignment with my values, and how living with less constantly reminds me of how much I have. In this post, I want to talk more about minimalism, because it´s trendy right now. 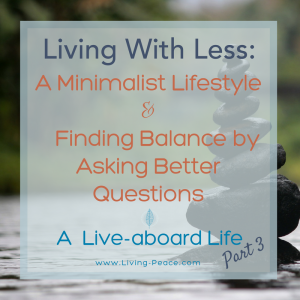 Even though I live on a sailboat, it wasn’t until I watched the popular film, Minimalism did I think, “Oh yea, I guess I’m a minimalist.” Being a liveaboard and, I guess being a minimalist was simply what I wanted to do and how I want to live. After watching the film I had the thought, “I don´t want to live with as few belongings as these two guys do.” I can tell you that you can fit more than you may think on a 30-foot sailboat if you like organizing! After having some conversations with friends and family, I came to the belief that minimalism is a spectrum. You can live bare-bones like the two guys in the film and possibly experience an inverse-related level of freedom in life, or you can live somewhere in the middle like me. You can even live with quite a lot of belongings and still be on the spectrum. The point is to let items that support and nourish you in your present life come in, and to let the rest go. It’s a practice, a tool in your toolbox, you can use in every chapter of your life. I think the real golden nugget of wisdom in the minimalism trend is something like “the middle path” in Buddhism. Let’s define minimalism as the right balance of items moving into and out of your life. Of course, everyone will have a different amount of items that serve them, depending on what chapter of life they’re in. A person with a family, for example, would probably need and feel in balance with more things than say, a single young professional. Do I feel like I am in control of my belongings or do they seem to control me? Do my belongings limit my choices on a daily basis or do they expand my choices? Do my belongings, in general, seem to support and enhance my life or detract from it? You can even apply these same questions to one belonging at a time. Does this belonging support me in what´s going on in my current life? Or does it weigh me down or slow me down by making other areas of my life more complicated? Before the age of consumerism, I think most people could have been labeled as minimalists, at least somewhere on the spectrum. Could it be that we’re just in an era of consuming stuff, stuff, and more stuff, so that minimalism seems extreme and unattractive? Perhaps we’re just in a place where the pendulum has swung too far to one side, and the minimalist movement is bringing us back into balance. The point of practicing minimalism is to have your belongings work for you and not against you, having your belongings support you in your current life. Do your belongings support and enhance your life and work for you, not against? If your answer is “No”, it may be a good time to ask yourself what would support you in finding that balance and create a more simplified environment that would serve you. If you’ve been working on or want to declutter your home and life even more or are already living a more minimal lifestyle, let us know what’s working for you and what’s not. Share your comments, suggestions, and questions in the comments below … Let’s talk! Supporting people in organizing, time-management, and simplifying has always come naturally for Sara. 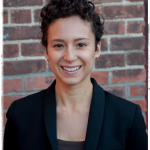 She´s had the opportunity to hone this skillset in her professional career, most recently while supporting three (incredibly busy) senior professors at Harvard Business School, and while working within a clinical research team at Dana-Farber Cancer Institute. Since June 2015, she has worked as an independent yoga teacher, specializing in un-learning habitual posture patterns that get in one´s way. Sara honors the act of organizing as both an internal and external process. Her approach is to keep it simple, so you have the mental and physical space for maintaining clarity and peace of mind. She loves that her services in professional organizing bring together two passions: internal and external de-cluttering. She thrives on living a minimalist lifestyle, living as a full-time liveaboard on her beloved sailboat.